12-inch Leatherface from The Texas Chainsaw Massacre is 12 1/4 inches tall on base to top of head. Assembled diorama base is 18 1/2 inches tall. Package includes Leatherface action figure, huge multi-part base, removable chainsaw, a rope pulley and a severed arm. Height: 12 1/4 inches tall on base to top of head. Assembled diorama base is 18 1/2 inches tall. Articulation: Neck, biceps, wrists and waist. 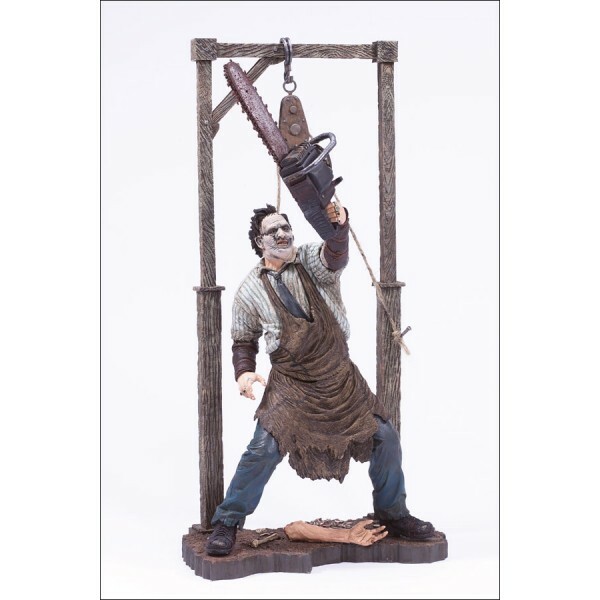 Accessories: Package includes detailed 12-inch-scale Leatherface action figure based on his appearance in the 2003 version of The Texas Chainsaw Massacre. 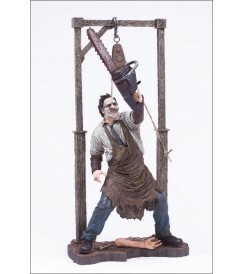 Includes huge multi-part base, removable chainsaw, a rope pulley and a severed arm.